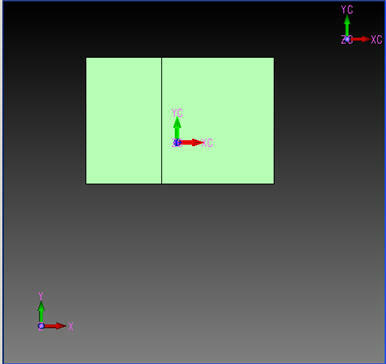 The main purpose of this function is to join multiple sheet bodies together to form one sheet body or solid. The function uses the Stitch Options dialog box. See Using the Function below. This function also can be used to determine coincident sheet bodies that may have come in from translation. If coincident sheets are found during the stitching, the Conversation Bar appears with Ignore, Delete and Model buttons, and the Coincident faces were detected prompt. Clicking the Ignore button causes stitching to ignore any duplicate sheets and to stitch the rest of the sheets together. Clicking the Delete button causes stitching to delete any duplicate sheets and to stitch the rest of the sheets together. Clicking the Model button results in the same behavior as clicking the Ignore button except that, in addition, wireframe entities representing the edges of the duplicate sheets are modeled in the part. The example below contains four sheets (two stacks of two sheets each). When the prompt for coincident faces appears, if you select the Ignore button, you get three sheets, one duplicate from each stack and the stitched sheet. If you select Delete, you get one sheet (the stitched sheet). If you click Model, you get four sheets and eight lines, representing the edges of the duplicate sheet from each stack. Click Modify>Topology>Stitch. The Stitch Options dialog appears, as shown below. Configure the dialog as desired, and click OK. The Conversation Bar appears. Following the prompts, select sheet bodies you want to stitch. The stitching begins. When the stitching process is finished, if it forms a closed solid, the following message appears. If the process results in an open solid a message will appear stating Stitching has formed an open sheet body. If you have more sheets to stitch, return to step 3. Otherwise, click Esc on the Conversation Bar to exit the function. Only open surfaces may be stitched together. You cannot stitch solid bodies to solid bodies. For example, a body consisting of a single face can be stitched to another face. However, the single face cannot be stitched to a solid body. If you are unable to stitch two bodies with this operation, try Modify>Boolean>Unite. Stitching is a quicker operation than the Unite operation. but Unite is less restrictive about the bodies involved.